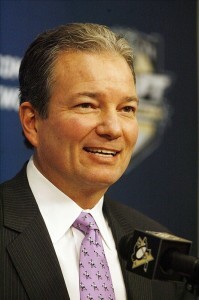 The Kris Letang negotiations will be the most important negotiations of Ray Shero’s GM career. Crosby and Malkin were bigger fish, but they wanted to stay in Pittsburgh and were happy to take a discount. The Jordan Staal decision — traded to Carolina last summer — came first, but he was a third line center. With the Letang situation, arguments can be made both to keep him and trade him. The Penguins rely on Dan Bylsma’s quick transition game style of hockey to drive their offense. Few players in the league are as good in transition as Letang and with Bylsma’s recent two-year extension, this style of hockey isn’t changing anytime soon. Shero can’t replace Letang. It’s that simple. On the other hand, what Letang does best is produce offense from the back end. The Penguins don’t need more goals. They’ve led the league in scoring by a wide margin the past two seasons and have scored loads of goals even when Letang has been out of the lineup. Letang’s offensive abilities could arguably be a lot more valuable on a team that has those kinds of needs. And that’s what will drive the Penguins’ decision. How valuable is Letang? You can answer this question in a number of ways. Years ago we noticed a trend in the Penguins draft strategy to target smooth-skating defensemen in the first round. Shero admitted that he can never have enough good defensemen (or centers) and they could eventually be used as assets in trades. Consider the blockbuster trades Shero has made in recent years involving defensemen like Ryan Whitney, Alex Goligoski, and Joe Morrow. All offensive defensemen. As we said in Part 1, point-producing defensemen catch the eye of everyone — even experienced General Managers. Shero’s defense-focused draft philosophy has also set the Penguins up well to survive in a post-Letang era. Only Simon Despres is ready to take on big minutes out of training camp next year, but scouts I’ve talked to are raving about Brian Dumoulin, Scott Harrington, and Derrick Pouliot. Some even think Dumoulin and Harrington are ready for NHL hockey right now. When trading an important piece like Letang, you have to consider opportunity cost and alternatives. What will the Penguins have to spend (via trade, free agency, or internally) to replace him? The Penguins’ pipeline of defensive prospects lined up to replace Letang is impressive and could be the key to their Cup-contending longevity. Letang doesn’t have any such pressures. He’s committed to the weight room in recent offseasons and spends many hours each week studying film with assistant coach Todd Reirden. It’s probably not fair to speculate on motivations, but the change in focus from Letang doesn’t seem like it’s for the same reasons as Malkin, who came back from his knee injury as a very mature player. Letang knows what he stands to make on the open market if he makes it there next summer and he’s taken steps to make sure he’s positioned to cash in. “That’s not my decision,” Letang said when the question was posed to him at locker room cleanout day. That answer doesn’t make much sense, so how about this: Kris, are you willing to take a discount to stay in Pittsburgh like many of your teammates have done? Not exactly the most comforting thing you want to hear if you’re Shero or the Pittsburgh Penguins, but Letang would also be smart to leave the negotiating to his agent. Negotiating through the media rarely works, especially when English isn’t your first language. Shero was also careful with his words when asked about progress on a Letang extension. That clarification caught my attention. Maybe I’m reading too far into it, but Shero made those comments on Thursday after saying on Wednesday that Letang wasn’t going anywhere. Part of any trade as a high-profile GM is managing public perception. Shero wanted to make sure fans didn’t assume that “not going anywhere” meant Letang and Malkin were Penguins for life. A league executive once told me to never trust anything that a GM says around trade deadline time. I went ahead and extended that skepticism to the June time period leading up to free agency as well. It’s not a coincidence that news ‘leaked’ the night before last year’s draft that Jordan Staal had turned down a 10-year, big money contract extension from the Penguins. When the Staal trade was announced to the hometown crowd at the Consol Energy Center, fans roared with approval. It was unbelievable. A trade involving a player who had been a long-time member of the Penguins core. I guess after hearing the news the night before, the fanbase was content getting rid of a player who didn’t want to accept an offer they perceived as fair. I’ve always wondered how the reaction would have differed if the news of Staal turning down the offer had never leaked. Just remember, everything in print or video over the next few weeks is being said for a reason. My cap limit on Letang would be $7 million, and even at that number I’d make a few phone calls beforehand. There’s always a chance a team in desperate need of scoring, franchise buzz, or a defenseman that can play 27 minutes a night is willing to part with a huge package of picks and players to acquire Letang. The timing of the negotiations will be interesting. Rob Rossi at the Tribune Review reported that no talks had taken place between Shero and Letang’s representatives as of Monday afternoon. Rossi said talks are expected to initiate in 7-10 days, which gives the two sides a handful of days to discuss prior to the NHL draft. There will be a flurry of activity at this year’s draft as teams scramble to get cap compliant and weigh the opportunity for compliance buyouts. If you’re going to trade Kris Letang, the draft is when you want to do it. This is where Shero has to be careful with timing. If contract talks with Letang stall out or end prior to the draft, his leverage with other GM’s diminishes because now he’s almost forced to deal Letang. Shero knew he had Carolina interested in Staal last year regardless of the leak that Staal had rejected the Penguins offer. It’d be surprising to hear a leak from the Penguins this time around and Shero doesn’t want to give Letang’s agent any incentive to kill the Penguins’ trade leverage. If Shero decides that a trade is a real possibility, he’ll have to juggle Letang’s reps while also creating a bidding war in the trade market from other teams. So let’s have a little speculative fun. 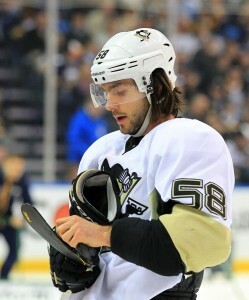 If the Penguins do decide to trade Letang at the draft, where will he go and what will they get in return? Shero has said in the past that he really doesn’t like to give up first round draft picks, but he sacrificed this year’s top pick in the Jarome Iginla trade a few months ago. Derek at the Pensblog mentioned to me the other day that perhaps Shero knew he’d have opportunities to recover that first rounder prior to draft day. Not a bad thought at all. Aside from a first rounder, the Penguins would also need to get a defenseman back in the deal that could pick up some of the minutes lost by Letang’s departure. Paul Martin rebounded in an amazing way this past season, but the Penguins can’t rely on him to play 30 minutes a night. They don’t need a defenseman anywhere close to as good as Letang, but simply a good value player that can fill in until the kids are ready. 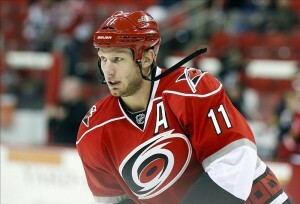 Think about the Staal trade. Brandon Sutter is much more affordable at third line center than Staal and should develop into a very nice player. He’s not as good as Staal, but he (and the other assets Shero received) will pay dividends in the future. Finally, the Penguins need to address their goalie situation. Even though I think Fleury will likely be back with the Penguins to start next season, I’ve felt for a while that he isn’t part of their long-term plans. I’d keep an eye out for young goaltenders on value contracts with nice upside. Colorado: The Avalanche are shaking up their franchise and have tons of cap room to spend. It’s hard to envision them moving their top pick in the draft, but they could use a player like Letang to build around on the back end. They’ve always been a team built around a great transition game. Florida: The Panthers aren’t quite in a position to spend big money on veteran players, but they’re a team on the rise. GM Dale Tallon built around Duncan Keith when he was in Chicago and might be starting to look for a Brian Campbell replacement. Letang seems to fit his preferences and needs. Can Tallon convince Letang to sign an extension in Florida? St. Louis: Coach Ken Hitchcock models his breakouts and defense retrievals off the Penguins and the Blues have been in search of a top right-handed defenseman for a while. They already have an impressive group of young defensemen, but could be at risk of an offer sheet this summer on Alex Pietrangelo or Kevin Shattenkirk. Montreal: The Canadiens could be to Letang what Carolina was to Staal — the team he wants to go to no matter what happens. Letang has always been fond of Montreal and their head coach Michel Therrien, the man Letang credits with developing his pro game. Other Teams to Consider: San Jose, Detroit, Ottawa. Got another idea? Let us know in the comments.